HP OfficeJet 6950 All-in-One printer delivers all the functions your small business needs, which include print, fax, scan, and copy. The printer has 46.4 x 39 x 22.9cm physical dimensions with 7.7kg weight. For easy-printing, this HP printer has a touchscreen of 5.6cm which is located on the upper right-hand side of the printer. The printer has a good paper handling capacity of 225 sheets. Moreover, this printer can quickly perform its task with a 35-page automatic document feeder. In addition to this, the printer is versatile with multiple operating systems, including Windows and MAC Series. This HP printer provides a top quality print with a high printing speed of 16 ppm and 9ppm for monochrome and colour print respectively. Moreover, the printer has a good printing resolution of 4800 x 1200dpi. To add ease to the printing process, the printer is backed by multiple connectivity options including Apple AirPrint, email print, and mobile print. The printer uses 4 HP OfficeJet 6950 ink cartridges to provides good quality prints. There is no doubt that this printer works well with good quality compatible ink cartridges. HP 6950 All-in-One printer falls under the inkjet category of printers. This printer is capable of printing, scanning, copying and faxing the documents. Touchscreen, ADF, and wireless connectivity options are add-ons to make this printer an ideal choice for small business printouts and home projects. How can I clear paper jam from the print zone in HP OfficeJet 6950 All-in-One printer? Step 1: Press the power button and turn off the printer. Step 2: Open the HP OfficeJet 6950 ink cartridge access door. Take up the handle of paper path cover and remove it. Locate the jammed paper inside your printer, grasp it with both your hands and pull it towards you. While removing the paper if it tears, check the rollers and wheels to ensure that there are no torn pieces of paper remaining inside the printer. Reinsert the paper path cover until it clicks into the place. Step 4: If the issue is not resolved yet, check the print cartridge area inside the printer. Make sure that you do not touch the cable inside the print carriage. Move the print carriage to the far right of the printer, if there is any jammed paper. If the carriage is unable to move, reinstall the HP OfficeJet 6950 ink cartridge. Take out the jammed paper and then pull it towards you. In case, the paper tears when you are removing it from the printer, check the rollers and wheels. Make sure that there are no torn pieces of paper inside the printer. Once the jammed paper is pulled out, move the carriage to the far left of the printer. Close the HP OfficeJet 6950 ink cartridge access door. Press the Power button and turn on the HP OfficeJet 6950 All-in-One Printer. Q. What is the maximum print resolution supported by the HP OfficeJet 6950 All-in-One printer? A. This printer supports a maximum printing resolution of up to 600 x 1200 dpi (Dots per inch). Q. Do you provide guarantee for the HP OfficeJet 6950 ink cartridges that you sell on your website? A. Yes, all our ink cartridges are FSC tested and certified and come with a warranty period of 12 months. If the product is deemed to be faulty we will replace or refund the item if it is in the warranty period. Q. Can you confirm that the ink used in your compatible HP OfficeJet 6950 ink cartridges is of good quality? A. Yes, we can confirm that it is of good quality. We use premium quality ink in our compatible ink cartridges. The quality of our compatible ink cartridges abide by the ISO norms and standards which make them a perfect choice for your printer. Q. My printer usage is extremely heavy. Do you provide any multipacks of HP OfficeJet 6950 ink cartridges ? A. Yes, we have multipacks in different sizes available on our website. These are more economical to use than individual packs. Q. The original black ink cartridge of my HP OfficeJet 6950 All-in-One printer has run out but the ink in all the original colour cartridges still remains. I am thinking of buying a black compatible cartridge from your website. Can I use compatible cartridges and original cartridges together? A. Yes, you can use our black ink compatible cartridge with the original colour ink cartridges. The printer will work absolutely fine. Q. 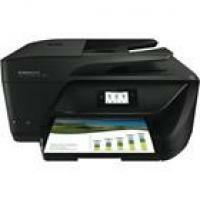 Is the HP OfficeJet 6950 All-in-One printer capable of performing wireless printing? A. Yes, this printer is capable of performing wireless printing. Wireless printing can be done through the use of a mobile device. You need to connect your printer to Wi-Fi and make sure that your printer is connected to the same network as your mobile device. Q. What operating systems does this printer support? In Windows OS, Windows Server 2003 and higher. In MAC OS, Mac OS X 10.9 and higher.